Lateral knee pain is pain that occurs on the outside of the knee. It may come on gradually over time or may develop suddenly after an injury. As a result, the symptoms are varied too. Outer knee pain may be a general ache or specific sharp pain and movement may be restricted. It may or may not be connected to a specific activity. The outer side of the knee is the least common place to experience knee pain. In most cases, localised pain on the outside of the knee is due to an injury affecting one of the structures on the outer side of the knee. However, in some instances, the pain may actually be referred from somewhere else, typically the lower back or the hip. What Causes Lateral Knee Pain? Here we will look at the most common causes of lateral knee pain, what causes them, the typical symptoms and how to treat them. At the end we will look at the common causes of outer knee pain by activity. If none of these sound quite like your problem, visit the knee pain diagnosis section for more help working out what is causing your pain. 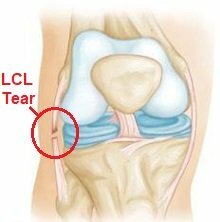 Wear and tear and inflammation in the joint can cause lateral knee pain. Arthritis typically affects the medial (inner) side of the knee more than the lateral side, but this is not always the case. The classic symptoms of knee arthritis are a dull, nagging achy pain in the knee, stiffness (particularly in the morning) and creaky/noisy knees. It typically affects people over the age of 50. 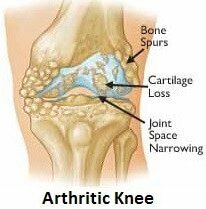 Find out everything you need to know in the knee arthritis section. Pressure along the path of the peroneal nerve can also cause outer knee pain. The peroneal nerve branches off from the sciatic nerve and runs down the outer side of the lower leg to the foot. Nerve pain is often associated with tingling, pins and needles and or numbness. Damage to the peroneal nerve usually occurs when there is a blow to the side of the knee, which squashes the nerve where it sits just below the skin. Alternatively, there may be pressure higher up the nerve where the sciatic nerve branches off from the lower part of the lumbar spine e.g. from a disc protrusion. The pain can refer (travel) down the nerve and may result in lateral knee pain, with or without associated back pain. Again, there will often be neurological symptoms as well such as tingling and/or numbness. Inflammation or degeneration of the biceps femoris tendon (one of the hamstring muscles), where it attaches to the outer side of the back of the knee, can also cause lateral knee pain. 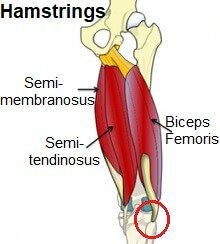 The area will be tender to touch and pain will get worse with resisted knee flexion. There may also be pain and stiffness in the knee after exercise. It usually affects people who play sports where there is a lot of acceleration and deceleration work. This is one of the most unusual causes of lateral knee pain. It affects the joint between the top of the shin bone (tibia) and the fibular, the small, thin bone that runs down the outer side of the shin, just below the knee joint on the outer side. It takes a large force to dislocate the joint, e.g. a car accident, but it can also partially dislocate (sublux) usually due to a fall when the foot is plantarflexed (toes pointing down), which often also damages the tibiofibular ligament. 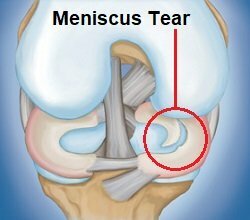 Symptoms usually include lateral knee pain, instability especially during deep squats and sometimes an obvious deformity at the side of the knee. There may also be associated damage to the peroneal nerve leading to pins and needles or numbness around the outer knee. Lateral Knee Pain From Running: The most likely cause of outside knee pain running is ITB syndrome. 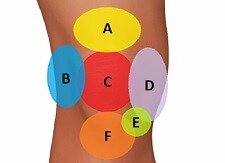 With ITBS, it is really important to rest from aggravating activities otherwise the condition can become chronic. This may mean reducing training time or stopping running altogether for a period of time. Lateral Knee Pain With No Swelling: Outside knee pain no swelling implies an overuse or degenerative condition such as tendonopathy, ITBS or runners knee, rather than a soft tissue injury such as a ligament sprain or meniscus tear. Lateral Knee Pain With Flexion: Outer knee pain when bending the knee often indicates a problem in the hamstrings as they are responsible for knee flexion. Lateral Knee Pain With Full Extension: Pain on outside of knee when you straighten the leg is often caused by something getting stuck inside the knee joint, typically from a cartilage injury or arthritis. 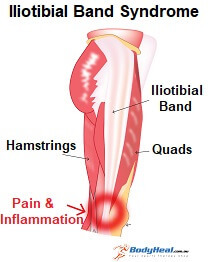 Lateral Knee Pain Going Down Stairs: Outer knee pain coming down stairs is often associated with Iliotibial Band Syndrome or lateral collateral ligament injury. Lateral Knee Pain And Instability: Outer knee pain that is accompanied by weakness and giving way at the knee typically indicates a knee ligament tear. The best course of treatment for lateral knee pain will depend on the underlying cause of the outer knee pain. It will usually include a combination of exercises, physical therapy and rest from aggravating activities and may also include knee injections and surgery. To find out more about these common causes of pain on outside of knee and how to treat them, use the links above. If you would like some help working out what is causing your pain using other specific symptoms, how the pain started or the specific location of the pain, visit the knee pain diagnosis section and learn what you can do about it. Remember, any new incidence of lateral knee pain should always be assessed by your doctor.